This past weekend, Mr.Man and I met up with Ginger and her boyfriend for a catch up in Liverpool. The sun might not have been shining all day but it was still pretty warm out so we headed down to the docks and up onto the rooftop bar attached to Matou. 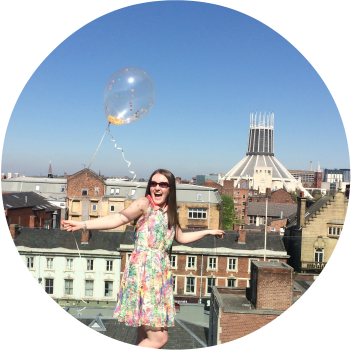 I’ve been wanting to try this place since last summer but I’ve never managed to snag a table – with amazing views of the Albert Dock, River Mersey and the Wirral, no wonder it’s so popular! Matou literally means harbour and what a harbour we have in Liverpool. It’s one of my favourite places in the city to go to just relax and watch the world go by. We started with a couple of obligatory ‘it’s the weekend let’s celebrate’ cocktails, I had a seabreeze – vodka mixed with orange juice, passion fruit liquor and grenadine, and a strawberry daiquiri which was just huge! It was already over flowing and melting down the sides of the glass before it even got to the table; strawberry puree, lime and Bacardi. It’s the perfect ‘grown up’ slushy! Matou is a pan Asian restaurant offering signature fusion dishes as well as exotic delights from Singapore, Thailand, Japan and Malaysia. Not only are the views of the docks and Pier head breathtaking but the food is pretty damn good looking too. As we had a great spot out on the terrace, we decided to order some food from the bar, which offers a selection of delights giving you just a taste of what the main menu has to offer. I chose the Beef Ho Fun because who doesn’t just love that name? And I was craving noodles, I haven’t had them (home cooked don’t count!) in forever and of course, being in an Asian restaurant, I just knew they’d know how to make the perfect noodle. 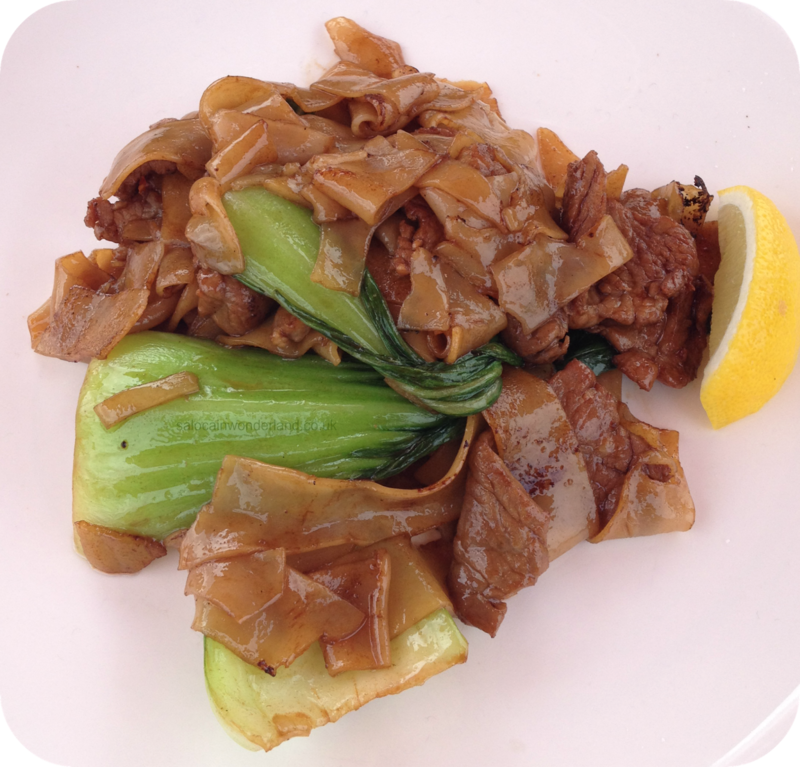 The Beef Ho Fun consisted of a huge pile of flat noodles, lots of thinly sliced beef and a huge pak choi. Now, this is were I wish I was a proper ‘foodie’ because I just couldn’t place the exact taste of the sauce everything was cooked up in – I want to say it was somewhere between oyster sauce and soy sauce – probably more soy sauce, but the menu didn’t specify! Either way, it was delicious, no complaints from me that’s for sure! 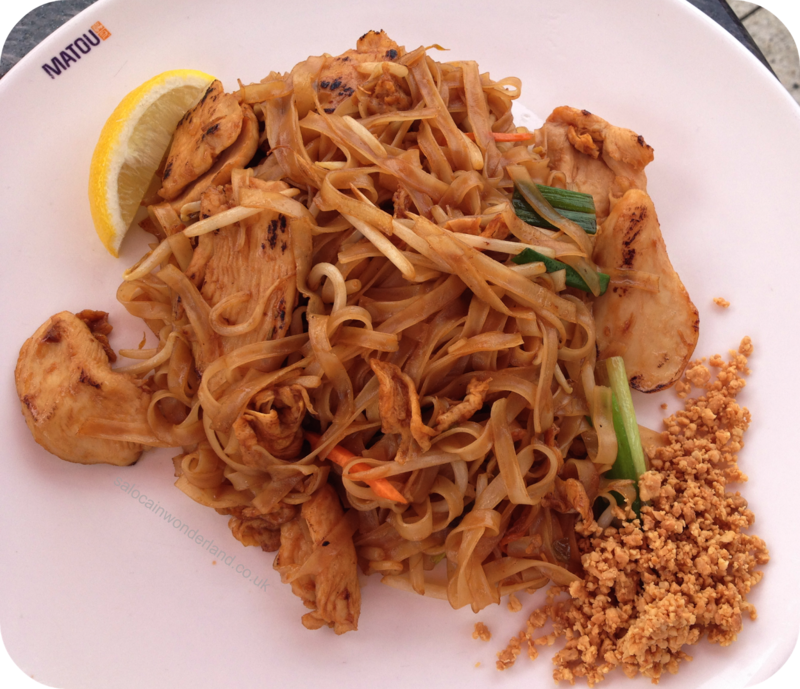 Mr.Man went for the Chicken Pad Thai. It looked pretty good from where I sat and he went pretty quiet as he cleaned the plate! I’m pretty sure that’s guy speak for tasty and delicious! 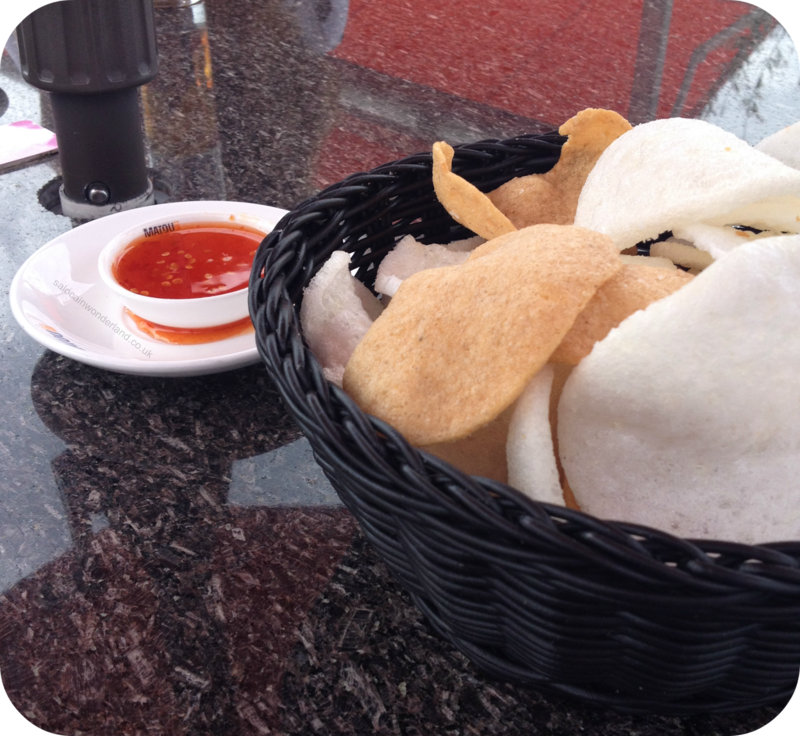 We also ordered a side of prawn crackers with a sweet chilli dip. These on their own make the perfect bar snack, they tasted amazing – I just wish I could place the taste of the darker coloured prawn crackers, they tasted very fishy, we’re thinking crab maybe? The staff at Matou were super friendly and helpful too, so attentive and managing the bar well enough when it got busier later in the afternoon. I was a little disappointed when I ordered a Pimms and it came minus the fruit but it’s not a deal breaker for me. The main restaurant side looked amazing, very swanky indeed. I’d love to head back sometime and try out the restaurant, the floor to ceiling windows offer the most amazing views, I’d love to see it at night! 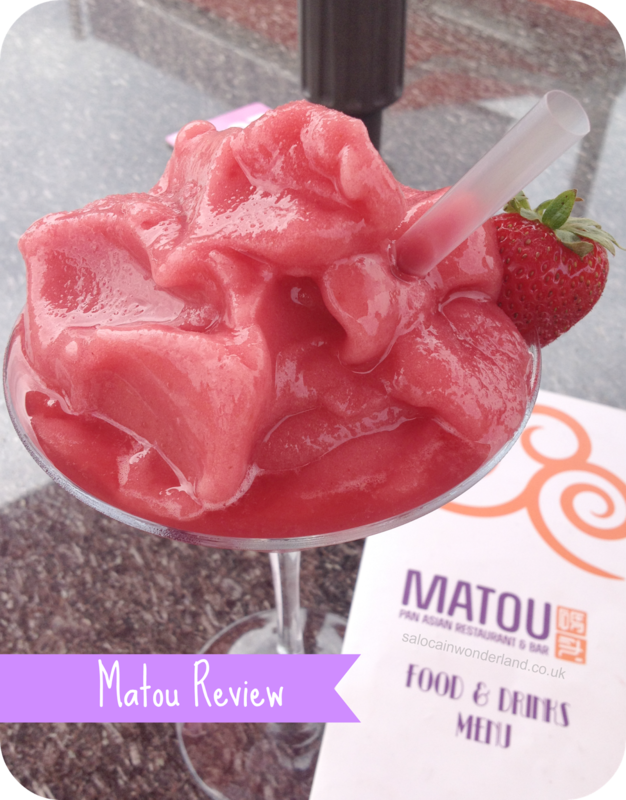 Have you been to Matou? Do you prefer dining al fresco in the sunshine or indoors under the air con? Let me know in the comments below! Oooo you can't beat drinks outside! I love me a beer garden!